Patti Smith’s 1975 debut album Horses was virtual ground-zero for the global new wave/punk rock revolution. 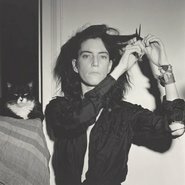 Its unmistakable cover – a stark black-and-white portrait of Patti – was created by her friend Robert Mapplethorpe. As friends, lovers, collaborators and soul mates, Bob and Patti played an important role in each other’s artistic development and rise to fame. In this talk, music writer Clinton Walker uses the iconic Horses album cover as the springboard into a search for the connections between art and music in the mid 1970s, which helped to give rise to the great cultural sea change of the era.